Beltsville, MD, June 11, 2013 - Empress Software Japan, consulting and support services provider of the robust, agile Empress Embedded Database, and Ryoyo Electro Corporation, specialists in information systems and software, announce the “M2M Data Collector”. M2M Data Collector solves the widespread problem of how to link data spread across devices, systems, equipment and applications. Intelligent industrial control systems with data sensors across factories easily replicate and collect data to a central location via the M2M Data Collector. 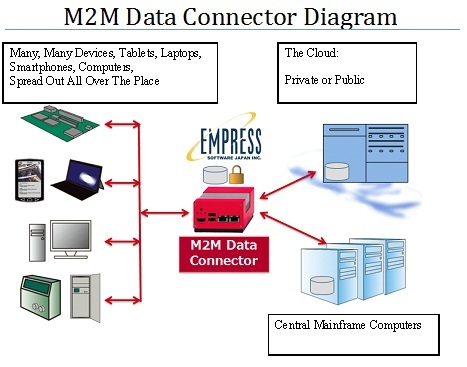 Empress Software Japan and Ryoyo Electro collaborated to develop the M2M Data Collector to piece together key data that resides on different embedded devices and miscellaneous other sources including databases floating around the cloud, hanging out on servers, or moving about on tablets. Empress Software Japan designed the M2M Data Collector to work on the Intel processor platform including the latest energy efficient “Atom” chip. M2M Data Collector debuts on Windows Embedded with future availability planned for embedded devices on Linux, ITRON, μ ITRON, T-Kernel, VxWorks, INTEGRITY, Tizen, Android, and iOS. The result is a small networked micro architecture offering secure data availability suitable for remote monitoring, FA (Factory Automation), communications, building management, smart grid, POS, industrial and office machines, medical, maritime and finance. M2M Data Connector is built on advanced technology. It takes advantage of the replication technology of the Empress Embedded Database resulting in high availability. With Empress Replication, accurate, reliable data can easily be available when and where it is needed the most. Using Empress Encryption, data can selectively be secure very efficiently and with low performance overhead. M2M Data Connector also reduces load on the network and devices. It is indeed, an ideal solution for medical, remote monitoring, factory automation, communications, building management, smart grid, POS, industrial and office machine applications. Empress Software Japan is the Japanese subsidiary of Empress Software Inc. which was founded in 1979. Empress Software develops and supports the EMPRESS Embedded Database management system worldwide. EMPRESS is a full-featured, high-performance database designed for embedded developers working with Android, Linux, Windows, UNIX, ITRON, μ ITRON, T-Kernel, VxWorks and real-time operating systems. In Japan, EMPRESS has been utilized successfully in diverse embedded fields including communications, FA, building management, entertainment, smart grid, POS, industrial and office equipment, and financial cloud applications. For more information, check our web site at www.empress.com , send e-mail to info@empress.com or call Empress at 301-220-1919.